The Short Stirling was the first heavy bomber used during the Second World War by the British Royal Air Force. Although it was built around a robust metal airframe and it was able to carry a good offensive load, the Stirling was gradually replaced in RAF Bomber Squadron with the more advanced Halifax and Lancaster. Thanks to its 4 powerful 1,635 hp Bristol Hercules engines, it was able to perform other important duties in airborne operations : dropping paratroopers and towing gliders. 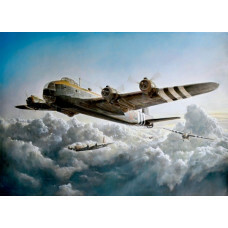 The Stirling Mk IV version was adapted to optimize the towing of gliders, such as Horsa and Hamilcar, with the elimination of nose and dorsal turrets and the introduction of mechanisms to release gliders. The Stirlings Mk IV were used in the Battle of Normandy and Operation Market Garden.